I was astounded at the scale of yesterday’s Northcote carnival. Although I’d seen the programme and heard about some of the preparations (and, of course, went last year) I wasn’t quite ready to see almost the entirety of Northcote Road so dramatically transformed. 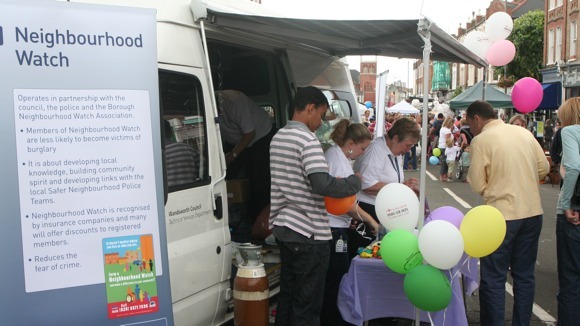 I spent a few hours with the council’s community safety team and local police offering advice and balloons to anyone interested (to be fair, my advice was usually to refer to the relevant expert there) accompanied by a police DJ! But I also managed a nice lunch at Vito’s (I rarely get that far up Northcote Road) and a good few strolls around to take in the atmosphere of a huge and incredibly fun event. I cannot imagine how many thousands of people visited throughout the day and evening, all in good spirits and with the weather staying good – despite some threatening grey clouds – I can’t imagine the organisers could have hoped for better. A fantastic day.